Is the election result a foregone conclusion? The only chance for Labor appears to be that a mass of voters will suddenly slap their heads while realising, "gosh, I was wrong all along", or that a host of people will suddenly appear to support the party. 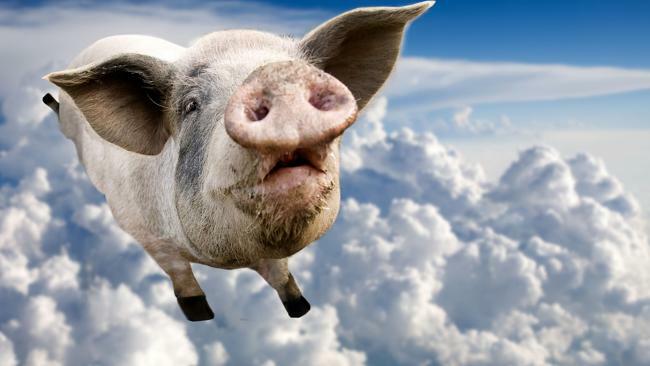 Pigs might fly (thanks to News Limited for the image). This column for the Canberra Times considers what is now perhaps Labor's only chance . . . appealing to those who normally vote informal. Labor has one last, desperate hope. It can still win the election, but it’s got to mobilise a whole group of voters who aren’t engaged in politics. That’s why, when Kevin Rudd delivers his message – that Tony Abbott’s going to “cut, cut, and cut” – he’s not actually speaking to you. Nor, probably, does he really believe what he’s saying: except to the extent that a coalition government is dedicated to returning the budget to surplus more quickly than Labor. No, Rudd’s words are instead directed to a very specific group of voters. Most people think the last election was indecisive. It wasn’t. A massive swing did ultimately decide the election result – but it wasn’t towards either of the major parties. Instead nearly 700,000 people cast informal votes. They got the result they wanted. Deadlock. Unenthusiastic about both leaders, they settled for neither. Mark Latham appeared on television shortly before the poll. After forensically examining Julia Gillard’s campaign (“real Julia”) and pseudo-policies (the ‘citizen’s assembly’ to discuss climate change), he urged people to vote informal. They listened, believing this was an intelligent reaction to the puerile options on offer. Informal voting surged. The key point is that the informals are, in the main, Labor votes. How do we know? Well, in the past three decades informal voting has only gone below three percent twice. In 1993 and 2007. Notice anything about those dates? On the first occasion Paul Keating clung to office despite a widespread expectation that he’d be swept away; on the second Rudd took office. At the last election informal voting surged to 3.75 percent. The swing to “none of the above” way exceeded any boost in support for the coalition. When the election began Labor kicked it off with a scare campaign. “Abbott’s going to raise the GST”, Rudd yelled to anyone who’d listen. “Nonsense”, responded Abbott. “Rubbish”, insisted Joe Hockey. But who cared? It planted the seeds of doubt. The whole thing was, of course, nothing more than an invention by Labor strategists. As such it was brilliant. Everyone knows the revenue base is declining. Dramatically. Something will, eventually, need to be done to fix this but that’s not Rudd’s concern. He’ll be long gone by the time someone comes to collect the bill. In the meantime it makes sense to put the frighteners on so that people will come out to vote. Plant the idea there’s a hidden agenda, scare people enough to get them out to the booths, and the rest will follow. Labor’s concern is to mobilise the masses. As long as they’re concerned enough to cast a formal vote the rest will look after itself. Expect the hype to increase even further. As long as people think there’s a real choice – and a real danger to their hip pocket – Labor’s still in with a chance. Despite the polling nightmare. Just look at the most marginal electorate in the country, Corangamite in Victoria. This year Labor’s Darren Cheeseman will again face off against Liberal Sarah Henderson. Although the seat’s been affected by redistribution, last time there were just 771 votes separating the victor from the looser. There were also, however, 3,117 people who voted informally. Now it’s much easier to get someone who couldn’t be bothered voting properly to make their mark correctly than it is to persuade someone they were wrong last time. And the easiest way to do this is to frighten them. That’s why Rudd keeps banging on about what Abbott might do if he slipped into power. It’s a very specifically targeted message and it’s aimed at a constituency Labor desperately needs. That’s why there’s so much agitation and hype coming from Labor. It’s a deliberate strategic move. If people think this election really matters, they’re less likely to cast their votes away. The more worried they are, the more likely they are to stick with the government. Rudd’s not really campaigning to change people’s minds – he wouldn’t bother with ridiculous thought bubbles about special tax zones if he was really attempting to present a coherent political philosophy to the country. That’s all pap. But pictures of him being mobbed by schoolchildren – well, that’s reassuring. Banging on and on about the slash and burn tactics if the other mob get in – well, that’s worrying. It might just be enough to get people who otherwise might not care to focus, for a second, and vote ‘no’ to change. As well as that, don’t forget that thanks to the largess of this government each party will receive $2.49 a vote. It might not sound like a lot, but it all adds up, particularly when the leader wants the party to spend everything on advertising and headquarters is more focussed on paying the bills the day after an election. There was a reason Rudd began his campaign pleading for money. I received a comment/question on my personal e-mail. . . I won't say who from, but the following is my response. "Yes, informal voting is an (exclusively) Aussie phenomenon associated with compulsory voting. Nevertheless (bizarrely) there is some small degree of informal voting in the UK. The assumption over there is that (a) someone in the family made them go to the polling booth or (b) when faced with the choice they suddenly balked out at the last moment. What makes our degree of informal voting so high is the difference between some states (where you can just put a '1') and the federal system where you must number each and every box. Of course overseas the issue isn't avoiding informal votes but rather just getting people out to the booths. That's becoming much more of an issue here, too. It's expected that more than 25% of eligible voters either haven't enrolled or won't bother going to a polling station. This is the real story, but the other was easier to explain."